Barcley by Baloubet has doubtless been one of the most interesting stallions of the 2014 Neumünster grading. He left the ring as licensed stallion due to lots of quality traits despite his still very youthful appearance. The Baloubet son gives the impression of an absolute performance horse. His conformation is characterised bylong lines and a head in very good proportion to his body, a flexible poll and good-sized neck blending nicely into very well-pronounced withers. His back is of adequate length, with a good loin coupling and good croup structure. On the whole, the young stallion displays a good, clear rectangular frame. Barcley has long legs with a correct structure. The hooves’ size and shape are in good proportion to his body. Following two months training under saddle, Barcley displayed outstanding movement. Even though his bloodline – except for Alcatraz – does not indicate these qualities, the stallion’s performance speaks for itself. The walk is ground-covering and very regular, thetrot always rhythmic and balanced, ground-covering and with good carriage, thus confirming the qualities indicated at liberty under saddle, as well. The canter is Barcley’s greatest strength with big, ground-covering strides, always uphill due to his good ability to carry weight from behind. His very good jumping technique combininggood foreleg and excellent hind leg technique is very useful,particularly in combination with his greatest strengths, his energy and performance attitude. Barcley‘s sire Baloubet du Rouet used to be the leading sport horse of his time under Rodrigo Pessoa: winner at the Athens Olympics,three times World Cup Winner, as well as winner of numerous Grand Prix competitions. He is considered one of the most successful jumping horse sires in the world, heading the WBFSH jumper sire rating in2012 and 2013. His most successful offspring include Chaman (KWPN),VDL Bubalu (KWPN) and Napoly du Ry (OLD). 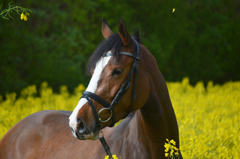 His dam Varfella is by Clearway, whose offspring have been attractingattention due to their recent achievements in competition at domestic and international level. Her maternal 2nd sire Alcatraz is an Alme grandson from the proven Holsteiner stem 242, known to pass on performance attitude and outstanding rideability with great reliability. The young stallion meets the high expectations arising from his bloodline to the full extent. The Schlieckau 70-day performance testing in autumn 2015 clearly manifested Barcley’s strenghts. Training scores at 9.5 for free jumping, 8.5 for stadium jumping, 8.0 for rideability and 9.0 for cross-country jumping abilty and canter definitely reflect the stallion’s performance potential.